Your due date is one of the first things calculated in your prenatal care. The due date is something that will help guide both you and your practitioner for gestational age-appropriate prenatal care, testing and ultimately your baby's birth. It is, therefore, very important to ensure that you have the most accurate due date possible. What is Causing You to Consider Changing My Due Date? Is there some new clinical data? Is my fundus (top of the uterus) measuring differently than expected? If so, what else might be causing that measurement to be off? One example might be a larger amount of amniotic fluid or even something as simple as your baby’s position. How Sure Are You of This Change? One common scenario that I hear is that a mom has been told that her due date is a certain date her whole pregnancy, but then at an ultrasound near the middle of pregnancy, she is told a different date, usually only a matter of days different. But the truth is this change, if it is less than fourteen days in either direction, is probably within the normal variation, because ultrasound at this juncture is limited in its use for dating a pregnancy. The specificity of ultrasound dating a pregnancy varies with each trimester with the most accurate dating in the first trimester (which will vary +\- seven days) and least accurate dating in the third trimester. Could Something Else Be Causing Us to Consider This Change? Other examples of things that might alter these readings would be the discovery of a twin pregnancy, uterine anomaly, maternal weight, etc. Does This Change Alter My Care? If So, How? Most of the time an altered due date will not immediately affect your prenatal care. The alteration potentially comes at the end of pregnancy when looking at intervening to end a pregnancy earlier because of the new due date. If you do decide to go with an amended due date, this is something to remember if it comes time to start talking about induction of labor. One of the best ways to avoid changes in due dates is to ensure that you have the most accurate data up front. 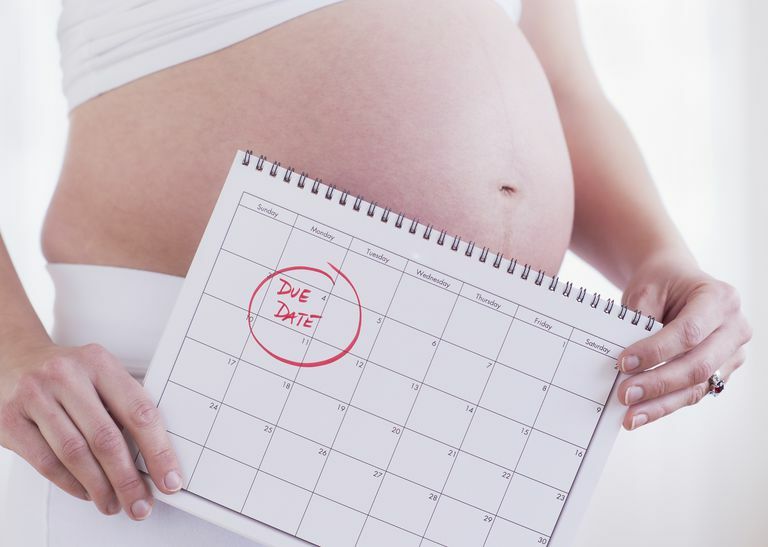 When we look at a due date that is derived from your last menstrual period, we consider this to be plus or minus fourteen days, meaning that we expect that your baby will show up between weeks thirty-eight and forty-two from the date calculated. The average length of gestation is 266 days from conception, often reported as 280 from the last menstrual period. One issue with this measurement is that it assumes that you ovulate on day fourteen. This may not always be true. If you do not know when you ovulated, you can also consider using the length of your cycle and counting backward fourteen days. Naegle’s rule is used to calculate a due date. This says that you take the first day of your period and count backward three months, and then add a week. So if your period started on February 1st, you would count back three months to November 1st and add seven days for a due date of November 8th. So for someone with a thirty-two-day cycle, a good guess for the date of ovulation would be day eighteen, which would alter your due date by four days. While four days may not seem like a lot of time at the beginning of your pregnancy, it may mean a lot of time toward the end of pregnancy when looking at whether to do an induction of labor or wait a few more days. Never hesitate to ask questions about a due date change. The information can only help you understand what is going on and why this is being discussed. It can help you move forward with the healthiest pregnancy possible. Declercq ER, Sakala C, Corry MP, Applebaum S, Herrlich A. Listening to Mothers III: Pregnancy and Childbirth. New York: Childbirth Connection, May 2013. Gabbe SG , Niebyl JR, Simpson JL, Galan H, Goetzl L, Jauniaux ER, Landon M. (2007). Obstetrics: Normal and Problem Pregnancies (5th ed. ): Churchill Livingstone. Goldenberg, Robert L., McClure, Elizabeth M., Bhattacharya, Anand, Groat, Tina D., & Stahl, Pamela J. (2009). Women's Perceptions Regarding the Safety of Births at Various Gestational Ages. Obstetrics & Gynecology, 114(6), 1254-1258. Can Ultrasounds Accurately Predict Your Due Date? What Are the Reasons You Should Call Your Doctor During Pregnancy? Is It Safe to Keep Working Until Your Baby's Due Date? Why Do Women Choose a Midwives for Their Pregnancy? What Should You Expect From Your First Trimester Ultrasound?